Demi burst into Kesha&apos;s bedroom just in time to see her pushing a blade against her wrist. "DON&apos;T YOU DARE!" Demi screamed in horror. "DROP THAT BLADE RIGHT NOW! DO YOU HEAR ME, KESHA? DROP. IT!" Kesha froze for a second before screaming right back at Demi. "SHUT. UP! YOU ARE SUCH A HYPOCRITE, LOVATO! YOU WERE A FREAK TOO ONCE! DID YOU THINK I DIDN&apos;T KNOW THAT? EVERYBODY KNOWS! YOU CAN&apos;T SAY ANYTHING, SO JUST GET OUT!" She cried and began ti throw things across the room at Demi, who tried to take cover. "JUST PRETEND YOU NEVER FOUND OUT, GOT IT?" "I ALREADY KNEW!" Demi yelled back. "I already knew... That&apos;s what I&apos;ve been trying to talk to you about. I felt your scars Kesha, and I saw them... The only difference now is that I&apos;ve seen you do it... 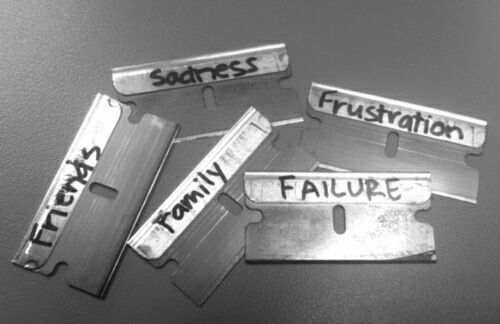 Please, just put the blade down." "I-I-" Kesha stammered, then she suddenly broke down. "I can&apos;t," she sobbed and let her knees buckle underneath her. "I can&apos;t! Just leave me, LEAVE ME!" Demi rushed quickly to her side and began to prise the blade out of her hand. Once she had it, she tossed it as far away as possible. "Shhh, it&apos;s okay. I&apos;ve got you now, shhh..." She soothed, clutching Kesha and stroking her hair gently. Kesha didn&apos;t hug Demi back and just hung her head in defeat. "I&apos;m going to help you, baby girl. Whatever it takes..." Demi promised. "You can&apos;t," Kesha replied. "I don&apos;t want you to anyway..." Then Kesha&apos;s mood changed again and she started to yell. "IT&apos;S ALL YOUR FAULT I&apos;M LIKE THIS. YOU!" Demi winced and backed away nervously. "M-me? What did I do?" She asked as tears appeared in her eyes. "Figure it out," Kesha muttered darkly and staggered to her feet. "I&apos;m going to clean up..."
Demi reluctantly let her go, although it was against her better judgment. Once Kesha reappeared, Demi decided to confront her. "Listen, baby girl... I know you&apos;re not going to like this, but... I&apos;mgoingtohavetotellyourparentsaboutthis," Demi rambled all at once. "I&apos;m sorry, what?" Kesha asked in confusion. "Demi, I didn&apos;t get a word of that!" "I said," Demi took a deep breath and prepared herself for fireworks. "I&apos;m. Going. To. Have. To. Tell. Your. Parents. About. This." She said, pronouncing the words extra slowly and carefully. Kesha cursed at Demi, causing Demi to flinch. "Don&apos;t use that kind of language!" She cried. "Cussing is a horrible habit!" "One, it&apos;s cursing! If you&apos;re going to say it, say it right. Two, you&apos;re not telling my parents anything. You are going to go home, and never come back. Do you understand me?" Kesha screamed at the top of her lungs, anger evident on her face and in her voice. But Demi looked past that, instead she was the absolute fear and terror that was actually shooting painfully through Kesha. "How about we make a deal instead?" She said calmly. Kesha just scowled in response. "You let me help you, and I don&apos;t tell anyone. But if you don&apos;t and you don&apos;t even try to improve, I do tell them. Deal?" "No way!" Kesha cried. "Why would I even agree to that?" "Because baby, you don&apos;t have a choice." Demi sassed smartly. This earned her another scowl. "Unless of course, you want me to tell your parents..."
"Fine," Kesha growled furiously. "Deal." Demi grinned triumphantly and gave Kesha&apos;s shoulder a quick put, which of course Kesha shook off. She stormed off them, leaving Demi standing alone.